THE IDIOTS' BOARD: JUST BEWARE! "BEWARE OF DOGS! DOGS, BEWARE ALSO!" A literal translation of the caution in vernacular. This is a call. a call for all. and for dogs from brute men. Just wait and see the match. while men are more defensive than dogs. Who will win: offense with less defense or otherwise? 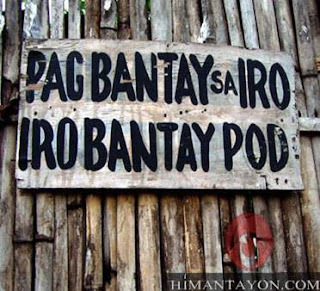 Hindi ako takot sa mga tulad mo, kakahol at kakahol ako.